This lesson explores El NiÃo by looking at sea surface temperature, sea surface height, and wind vectors in order to seek out any correlations there may be among these three variables using the My NASA Data Live Access Server. The lesson guides the students through data representing the strong El NiÃo from 1997 to 1998. In this way, students will model the methods of researchers who bring their expertise to study integrated science questions. 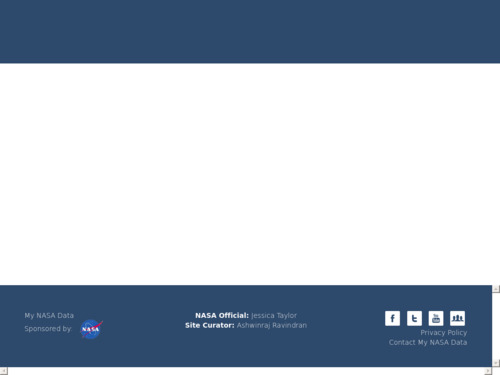 Some terminology has changed in the My NASA Data Live Access Server web interface, but it should be easy for educators to adapt their instructions to the student users of this website. There are no obvious instructions on how to save the images produced by the Live Access Server: Educators will need to make sure to instruct their students. Activity has students getting data by hand, which is a lot of work. Educators could download data ahead of time for students. Extensions to this lesson offer additional inquiry activities that address this topic. Other El NiÃo activities that include more recent data can be found at: http://sealevel.jpl.nasa.gov/. Students analyze data from 1997 and 1998, when there was a strong El NiÃo event. The Live Data Server does contain more recent data that could be used if educators wanted to consider a more recent El NiÃo event. TOPEX-Poseidon has been decommissioned: data on sea level is now collected by Jason 1 and 2. Student teams study single variables - sea surface height, sea surface temperature, or wind vectors using NASA data. Each team examines all variables for several dates to identify characteristic features of the static images and the changes in these features over time. Teams then describe the temporal variations they observe, look for relationships among the three variables, and discuss the causes and effects of these relationships. Comment from scientist: The connections among wind, sea surface temperature and thermocline etc. are accurate but rushed. Educators should provide more explanation of the connections or the figures. Detailed information can be found on the PMEL webpage http://www.pmel.noaa.gov/tao/elnino/nino-home.html. Different learning styles are addressed through the team approach. The use of animations in this activity supplies an alternate tool to improve student understanding. Both visual observations and written answers are required to the posed questions. Self-contained with links to support materials, including animations, other lessons and background.